In late 2010, when Qatar submitted their successful bid to host the 2022 FIFA World Cup, they rolled out plans for a host of innovative solar-powered stadiums designed to both protect sportsmen and spectators from the incredible summer heat, and demonstrate some extraordinary architectural prowess. One of those structures, The Showcase, is a neat 500 person net-zero arena designed by Arup Associates and constructed in just four months. The Showcase features a retractable roof, under-seat cooling, and a wealth of photovoltaic solar panels which feed the grid when the arena is not in use. With the enormous footprint that the world’s largest sporting event inevitably creates, host nations are often careful to address environmental concerns while showcasing groundbreaking design in their sport-centric urban developments. For the 2010 World Cup, South Africa constructed an array of eco-friendly stadiums, Brazil’s 2014 World Cup prompted a hotel to undergo a green renovation while organizers aimed for green goals in their new constructions, and Russia, host of the 2018 World Cup has set about constructing a high-speed inter-city rail system. 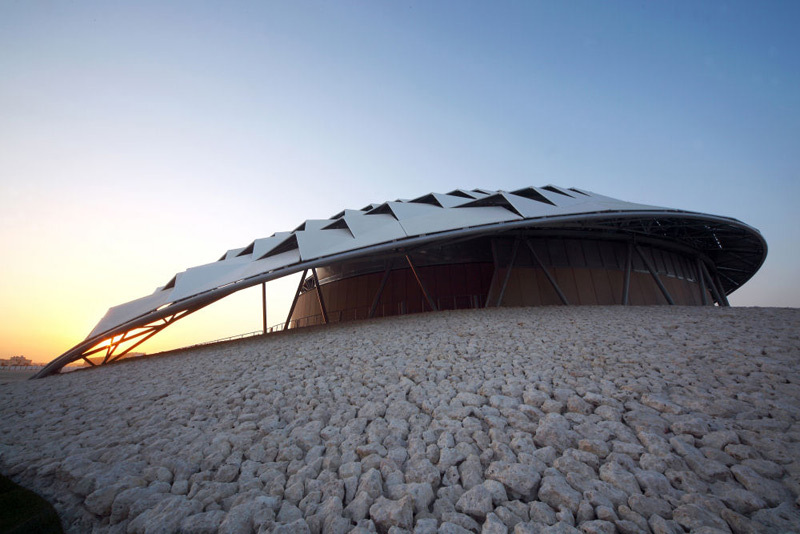 As Architecture World News emphasized, the oil rich nation of Qatar, easily able to afford cutting edge sustainable design for the sporting event “looks to counter prior misconceptions that arid locations are incapable of hosting major sporting events and does so with flair and panache.” Not only have they looked to develop incredible solar stadiums, but scientists in the country even developed solar-powered “clouds” to float above stadiums and block out the harsh sun rays. With The Showcase, such a “cloud” will not be necessary. One of the most striking features of the arena is its sweeping canopy of peaked panels, which can be maneuvered to provide shelter from the heat or aggressive winds, while maintaining natural ventilation where possible. Arup’s Sustainability Leader Michael Beaven described the threefold mission of the arena as seeking to “blend traditional passive design ideas with innovative technology for an energy-saving and comfortable architectural result,” while adopting Fresnel parabolic mirrors for solar thermal cooling and national grid-connected photovoltaic energy creation. On match days, when large amounts of power will be required, biofuel generated energy will supplement solar energy. But for the vast majority of the year that the stadium remains dormant it will serve as a large-scale solar farm for the area. With its incredibly small capacity of only 500 seats, the stadium might not be of tremendous use during the main events themselves – it will be used for more informal five-a-side kick-abouts. What The Showcase will provide is exactly what its name suggests — CIBSE Journal states that the stadium will serve as a facility “to monitor the performance of the technologies under desert conditions,” as Qatar’s World Cup planners gear up for the event to take place in ten years time. With the enormous footprint that the world's largest sporting event inevitably creates, host nations are often careful to address environmental concerns while showcasing groundbreaking design in their sport-centric urban developments. As Architecture World News emphasized, the oil rich nation of Qatar, easily able to afford cutting edge sustainable design for the sporting event "looks to counter prior misconceptions that arid locations are incapable of hosting major sporting events and does so with flair and panache." 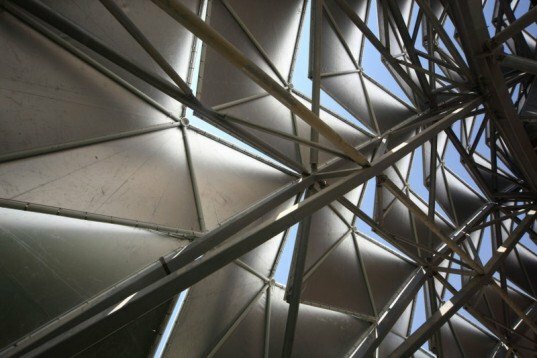 Not only have they looked to develop incredible solar stadiums, but scientists in the country even developed solar-powered "clouds" to float above stadiums and block out the harsh sun rays. With The Showcase, such a "cloud" will not be necessary. One of the most striking features of the arena is its sweeping canopy of peaked panels, which can be maneuvered to provide shelter from the heat or aggressive winds, while maintaining natural ventilation where possible. Arup’s Sustainability Leader Michael Beaven described the threefold mission of the arena as seeking to "blend traditional passive design ideas with innovative technology for an energy-saving and comfortable architectural result," while adopting Fresnel parabolic mirrors for solar thermal cooling and national grid-connected photovoltaic energy creation. On match days, when large amounts of power will be required, biofuel generated energy will supplement solar energy. But for the vast majority of the year that the stadium remains dormant it will serve as a large scale solar farm for the area. With its incredibly small capacity of only 500 seats, the stadium might not be of tremendous use during the main events themselves - it will be used for more informal five-a-side kick-abouts. What The Showcase will provide is exactly what its name suggests — CIBSE Journal states that the stadium will serve as a facility "to monitor the performance of the technologies under desert conditions," as Qatar's World Cup planners gear up for the event to take place in ten years time.